FLEXPAK™ – Mountain Power, Inc. The new FlexPak will revolutionize the way you work. FlexPak was designed using advanced Thin Plate Pure Lead Technology which provides increased energy density. Advanced technology and robust construction delivers exceptional performance. 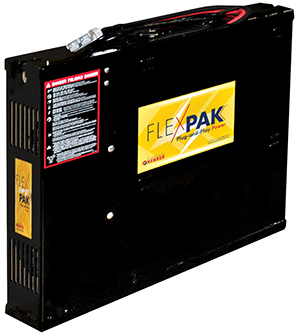 FlexPak employs batteries which are maintenance-free. The electrolyte is absorbed in a superior quality microporous glass mat with high absorption and stability designed to enhance cyclic capability. Positive and negative plates are low impedance, high-corrosion, resistant thin plate grids (pure lead) manufactured using a unique process. Containers are ABS, highly resistant to shock and vibration. Opportunity charging whenever the truck is not being used can eliminate the need for spare batteries and battery changing. On-board charger allows for charging via 110VAC outlets, anytime…anywhere. Suitable for multi-shift operations and optimizes machine availability. Reduced electricity costs for recharging due to very low charge factor. Minimum gassing – ideal for using in shops, public areas, and sensitive manufacturing areas.